I love going to auctions and bidding on broken things, because I know those are the things that not many others will bid on, so I can get a good deal. 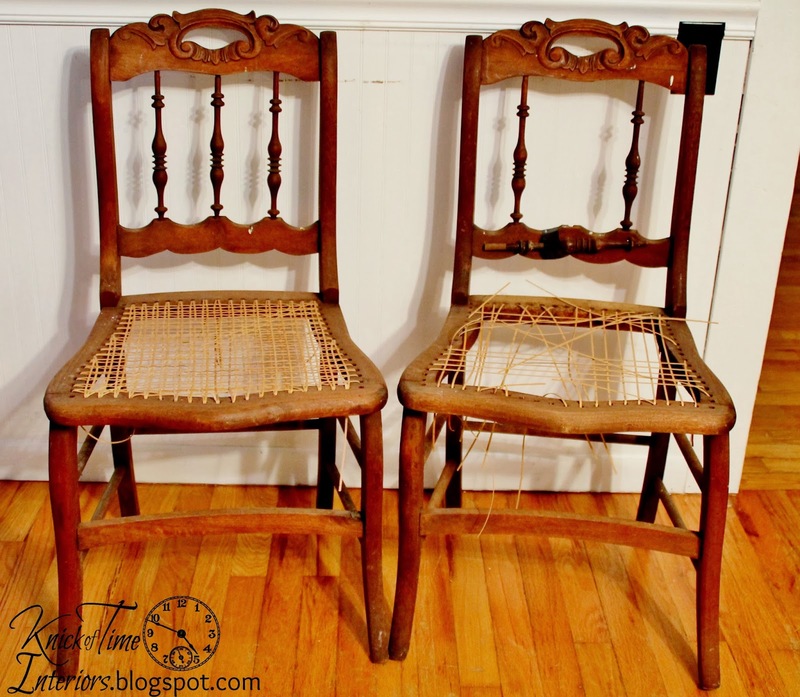 Last month, I bought a pair of antique caned chairs at an auction. It appears that someone started the job of recaning them, but never finished. I thought about trying to learn to cane them myself, but I knew the chances of that happening anytime in the near future were slim to none. One of the chairs has a spindle that’s come loose, so I haven’t done anything with it yet, but this is what I did with the other one. I am totally thrilled with how it came out. To get from the before to the after, my husband cut a wood piece, in the same shape as the caned area. 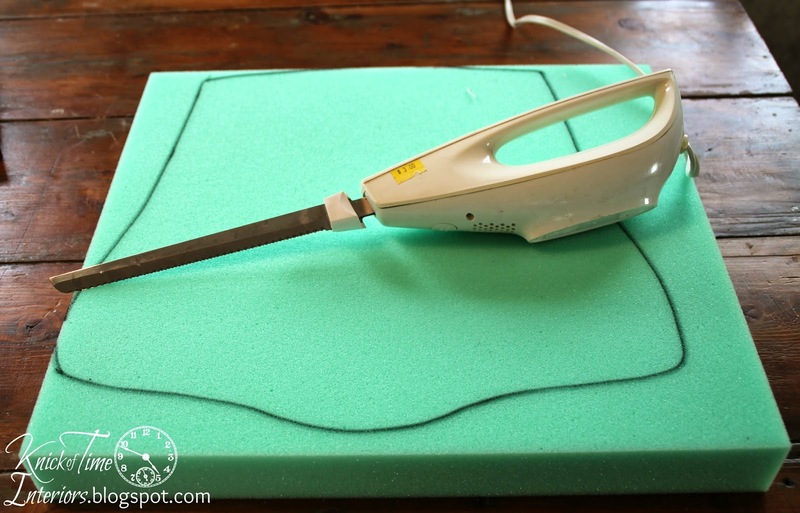 I traced that shape on some dense chair foam and cut it with my $3 thrift store electric carving knife. 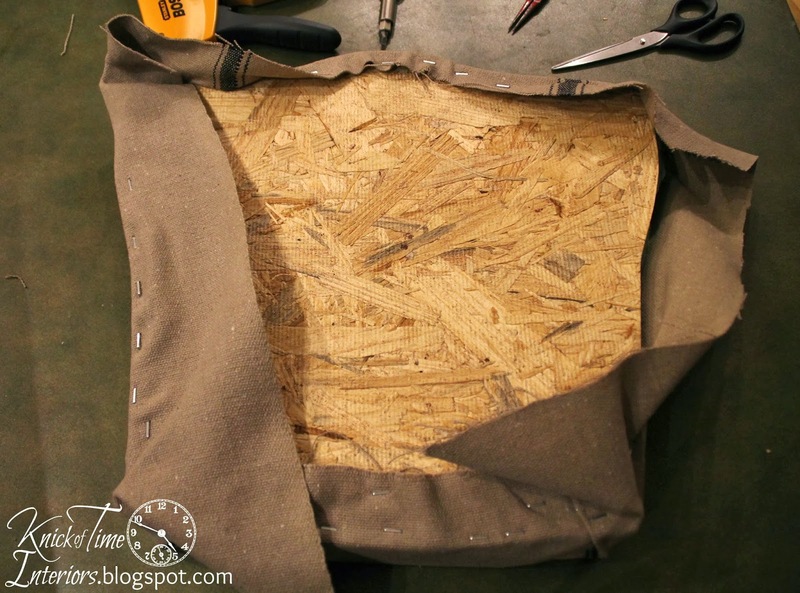 I cut a square of grain sack fabric that I had. This is the same fabric I used for my dry erase board. I stapled the opposite sides first, then had my teenage son stand on the board to “squash” the foam down while I finished stapling my way around it. I wouldn’t always do this, but the foam was really thick and rather than buying thinner foam, squashing it down helped decrease the thickness a little, while still having plenty of softness. The No. 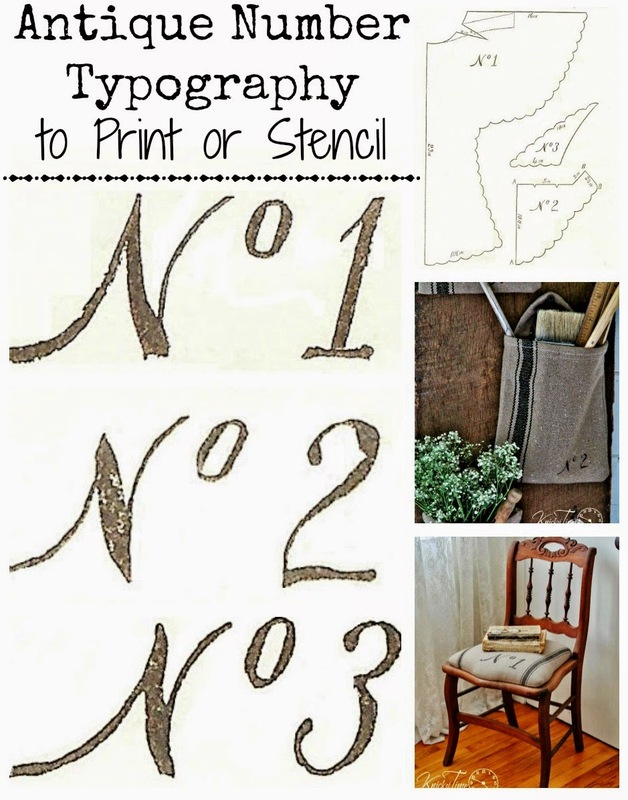 1 typography is a replica from a late 1800’s sewing pattern, that I made a vinyl stencil of, then painted onto the fabric. I shared that image here (as well as No. 2 and No. 3 that went with it). I briefly thought about painting the chair, but once I cleaned it well, the wood was too gorgeous and it didn’t need any help from me. I would love to have kept it, but I have so many chairs right now, and I don’t have anywhere to use this one, so I listed it in my shop (it sold). I’ll hang onto the other chair and if I can figure out a place to use it, I’ll fix the spindle and make another one for myself, because I absolutely love how it turned out. What an absolutely beautiful chair! What a great save! Great save Angie. I’m sure you’ll find some clever way to repurpose the other chair. Absolutely beautiful wood and can’t even tell you how much I love the grain sack cushion. Thanks for the idea. I’ll have to remember that at auction next time. I love your grain sack look even better than the caned seats. 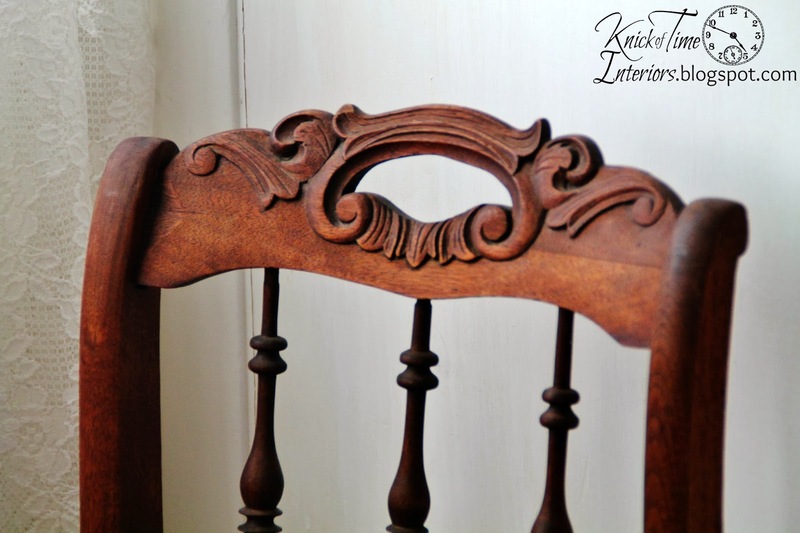 Love how your chair turned out, and all the detail in the chair! You saved another one! Love the style of the chair and the wood. The typography on the grain sacking looks great. Absolutely lovely. Anything grain sack is great and I admire the great way you brought the chair back to being loved again. That chair turned out beautifully, Angie! Wonderful antique chair and love the change with the padded seat. This is much more permanent than cane. I’ve got to admit that I have done this very thing before…I even taught myself how to cane chairs, however, I would have painted the wood. Upon seeing yours, I LOVE it in this natural wood state and think you did a fabulous job. Do you think we may jump the gun too much these days and paint almost everything? Thanks for sharing. I think it looks so much better Angie with the grain sack fabric than it would of recaned. Being someone who paints everything that doesn’t move, I’m surprised to say that I like the chair in it’s natural wood. Angie this is so cute!!! I love it far better with the pad than with the caning. Sharing later today. 🙂 and pinning! Fabulous makeover. I love the wood tone too, it’s gorgeous. It came out fabulous. I too bought fabric from that company and am waiting for the perfect piece to use it on. I love how you have numbered it. That totally finished it! And it’s awesome! Pinned to my creative furniture board. I love it, too! So glad to see you kept the wood finish as it really is beautiful! love this! great way to redo a cane seat chair. What a great find! I love what you did with it. I wouldn’t pain these chairs either. I love the mix of painted wood and unpainted wood in the home. It’s beautiful, Angie. I love the wood. The grain sack is the perfect way to freshen it. I think I love it as much as you do! Thanks for the numbers info. Wow, what a difference! I love the look so much better than the cane. How wonderful! But I’m curious since I’ve never made over a chair and new to furniture redo’s. How do/did you attach the new seat to the base? I can find chairs a dime a dozen (j/k) that do not have complete seats. I am wondering the same thing – how did you attach the seat? How did you keep the covered plank of wood from shifting around? Is is resting on top? Inset? I am working a a friends chair; she has a needlepoint remnant she’d like to me cover it with. Same scenario, it was once a caned chair and the caning is gone. Thanks for your tutorial – I wasn’t sure how it would look with no edging nails or ribbon. Love, love, love this! Found you over at The Scoop at Cedar Hill Farmhouse. If you have time, come on by! I love your chair and shared it on Friday Finds today! So, so, so beautiful! I adore it all, the styling is perfect! You are a genius and I think you just solved my broken cane chair problem… I painted it and was going to put a pot in the seat but it’s getting late in the season for that so I LOVE your idea better! Thanks! Thanks for the great idea. I have a ladder back chair I could use this on. I enjoy your posts! I love the wood frame left natural. The grain sack is a perfect match. Another beautiful creation, Angie! I featured it as a Friday Furniture Favorite! I just bought 5 chairs similar to this for my classroom. How did you attach your reupholstered plywood to the chair? I would like to know the same thing. How did you attach the board to the chair? Janet, the board is screwed from the underside through the holes where the caning had been. Cynthia, Your page on Instagram is private, so none of your photos are displayed. Gorgeous chair! So glad you didn’t paint all that beautiful wood. The chair cushion looks so nice with it too. Good job Angie!